The Friends of the Monument were featured as part of a series on the ocean that played on NBC Nightly News during the week of Earth Day. NBC also put together a piece called, "Voices from Saipan," that is viewable only on the Internet. WASHINGTON, D.C. (Office of the CNMI Congressional Delegate) — Gregorio C. Sablan joined a select group of members of Congress at a public charter school in southeast Washington today to witness President Obama sign into law the Edward M. Kennedy Serve America Act. The new law is the most far-reaching expansion of opportunities for national service in almost a generation. Sablan was an original co-sponsor of the bill and spoke in support of it during debate on the House floor. The Edward M. Kennedy Serve America Act was brought to life through a collaboration between the Senate and the House of Representatives Committees on Education and Labor, of which Sablan is a member. The Act has been hailed as landmark legislation that will not only encourage a new generation of Americans to engage in public service, but will also create positions that will help to simulate the economy and provide benefits to those in need. “Throughout his campaign and the first months of his administration, President Obama has encouraged Americans to engage in service to their own communities and to the nation,” said Sablan. “I am so proud to have been able to add the support of the people of the Northern Mariana Islands to the president’s call for service. Serve America expands the number of service-oriented jobs funded by the federal government from 75,000 to 250,000. It also creates several new service groups, including a Clean Energy Corps, an Education Corps, a Healthy Futures Corps, and a Veterans Service Corps. New opportunities will be available for senior citizens, as well as for disadvantaged and foster youth and for those with disabilities. These volunteer positions benefit participants not only with work experience, new professional relationships, and valuable job skills, but also by giving them money for college. Also attending the event was Sen. Edward M. Kennedy himself, whose voice was strong, though his hands trembled on the podium. Kennedy, D-Mass., is battling a brain tumor. He was joined by Sen. Orrin Hatch, R-Ut., Rep. George Miller, D-Ca., Speaker Nancy Pelosi, D-Ca., and Senate Majority Leader Harry Reid, D-Nev.
Other members of the audience were first lady Michelle Obama, Vice President Joe Biden, former President Bill Clinton, former first lady Rosalind Carter, former Secretary of State Colin Powell, and New York Mayor Michael Bloomberg. The students and teachers at Brilliant Star School and Whispering Palms School adopted the lighthouse for the Island Wide Cleanup. They want to adopt the spot for the rest of the year, too! Thanks! We're done tallying up the final numbers for the Island Wide Cleanup. It is funny to think that several weeks worth of work are going to boil down to a sentence like, "27,070 lbs of trash were picked up by 4,140 volunteers from 61 volunteer groups at 54 adopted sites." I guess that's what this kind of stuff comes down to in the end. There are too many people to thank for our success, but my Thank You letter is a start. The students at William S Reyes Elementary cleaned the beach in front of their school. Catherine Anderson and the Tottotville Community led a cleanup of their neighborhood. Marianas Visitors Authority and Northern Marianas Dive Operators Association teamed up for a cleanup of the Laulau Bay Dive Site. Some of the volunteers aren't shown...because they were underwater! 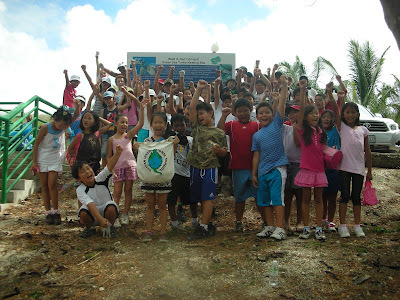 Ladera International School of Saipan had a very successful cleanup of Coral Ocean Point. Would you look at that pile of trash? Friday was an amazing day. Thank you. 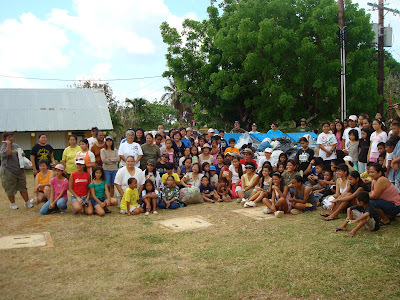 Thousands of people came together for a single cause: a more beautiful Saipan. Young and old, citizen and non-citizen, local and non-local, government workers and business owners volunteered a few hours of their time to pick up the trash littering our beautiful island. Later this week the islands of Tinian and Rota will do the same. Again, Thank you. Our results were staggering. The final numbers are still being tallied, but our preliminary count shows 4040 volunteers, 55 volunteer groups and 48 adopted sites on Saipan, and 12,960 lbs of trash removed from our streets, beaches, and parks. The collaboration between groups to make this island wide cleanup a success was enormous. Division of Environmental Quality (DEQ) and Rotary Club of Saipan handled most of the pre-cleanup coordination and sign-ups. Marianas Visitors Authority, Marianas Tourism Education Council, McDonald’s, and the Kramis Family provided funds for supplies and prizes. On the day of the cleanup DEQ, Bureau of Environmental Health, and Division of Parks and Recreation coordinated all of the trash pickup. Additionally there were 55 volunteer group coordinators, who ensured that their adopted site had rubber gloves, trash bags, and most importantly, volunteers. In every way, from the total number of volunteers, to the number of participating groups, to the amount of litter removed, this year’s cleanup was bigger than anything the Beautify CNMI coalition has ever accomplished. Furthermore, if the success of this cleanup has anything to teach us, it is that the government does not have the sole responsibility of solving our social problems, nor do they hold a monopoly on having the ability to fix them. We just showed that with a slight change in ethic and a small amount of effort on everyone’s part we can move mountains, in this case a 6.5 ton mountain of cans, bottles, and cigarette butts. Unfortunately, Saipan’s streets and beaches will be covered in litter by the end of the week. Over the weekend hundreds of people went to the beach and left their trash, cigarette butts and cans are still being thrown out of cars, and homestead residents continue to dump their trash in the jungle. Instead of being discouraged by this realization, I ask all of you to become reenergized. Change happens. 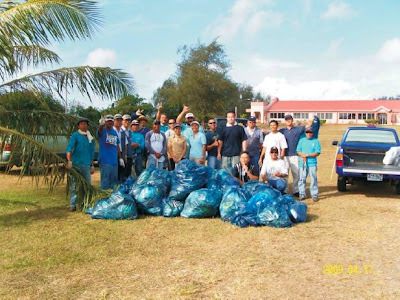 The success of Beautify CNMI over the last three years and this latest cleanup are proof of that. Let us redouble our efforts to turn the Marianas into the cleanest, safest islands in the Pacific. I encourage the volunteer groups that participated in this cleanup to adopt their spot for the next 12 months. Become the steward of that road, beach, or park for the next year. I also encourage the eight government agencies charged with enforcing our litter laws to start making examples of some of the worst litter offenders. Hand out a few of those $500 tickets to businesses not properly storing their garbage or to residents dumping their trash illegally. Finally, I encourage our donors to continue supporting our cleanup efforts. We cannot paint over graffiti if we do not have paint and we cannot pick up litter if we do not have garbage bags. Volunteers, government policy, and business support are the three legs on which Beautify CNMI stands. The continued involvement of all three will improve the quality of life for the people that live here and make us a more desirable tourism destination. Again, thank you to all who have supported the concept of Beautify CNMI over the last three years and to everyone who participated in this historic island wide cleanup. I look forward to many more years of collaboration and hard work as we move towards a more perfect Commonwealth. The staff at Aquarius Beach Tower staff teamed up with Max Aguon and boys, last year's Beautify CNMI Steward Award winner, to clean up the area south of Sugar Dock. Thank you! Our super volunteers from Paseo de Marianas Promoters did their cleanup where else? The Paseo de Marianas! The students, teachers, and parents of San Vicente Elementary had their cleanup on Saturday morning. They were joined by Friends of the Mariana Islands, who provided the pictures. Marites Castillo has more photos on the FMI blog. I CAN'T thank everyone enough! A MILLION THANKS to all of you who came out yesterday and will come out again today to participate in the 2009 Island-wide Cleanup in observance of this year's Environmental Awareness Month. 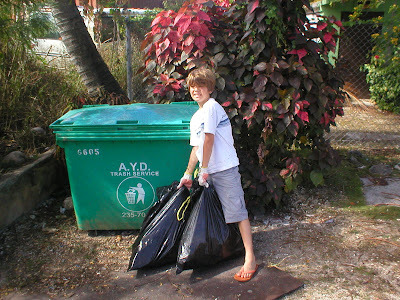 The number of participants this year shattered the number we established almost three years ago with the 2006 Island-wide Cleanup called "1020 on 10/20" (Where we asked for at least 1,020 volunteers to participate in the Island-wide Cleanup on October 20, 2006, but got 3,380 volunteers instead!) This year, well over 4,000 volunteers (4,040 yesterday morning and counting!) from government, private, and the community set aside whatever they were going to do yesterday to collectively do one GREAT thing for our community -- BEAUTIFY IT and walk right into history while at it! Angelo Villagomez (of Beautify CNMI!, the Rotary Club, Pew Environmental Group, Friends of the Monument, and MINA)and Joe Kaipat of DEQ did an outstanding job of organizing this massively successful cleanup. Thanks to our wonderful sponsors: The Rotary Club, DEQ, MVA, NTT Docomo, McDonald's, Ron & Nancy Kramis, PDM Promoters, Marianas Tourism Education Council, and Beautify CNMI! Oh, and by the way, THANKS to Bank of Guam and Shirley's for donating the money to build our Beautify CNMI! trailer and THANKS to FMI for building it. Joe and the DEQ gang put the trailer to good full use during the cleanup! And one final thought -- Can you all think of a better way to showcase our beautiful islands to our many friends and visitors who will be arriving by sea and air to attend our Flame Tree Arts Festival? Please...Let's keep our islands clean and beautiful. Let's continue to Beautify CNMI! Close to 4,000 young and adults picked up tons of trash along Saipan's major roads, beaches, parks, dive sites and other tourist spots yesterday as part of the islandwide cleanup highlighting the observance of Environmental Awareness Month. Camacho was among the OPM employees and their families who picked up trash at the Garapan Fishing Base starting at 2:30pm yesterday. Just a few meters from her was 4-year-old Ila Seman, the youngest of the OPM employees' family members to take part in the activity. “Please do not throw your trash anywhere,” Joannie Laniyo, 7, said as she tagged along with her mother, OPM employee Benita Seman, for the cleanup. From 7am to 4:30pm, thousands of volunteers from the private sector and the local and federal government cleaned Saipan of litter-from cigarette butts, plastic bottles, soda and beer cans, plastic bags to soiled baby diapers. Michael Lizama, 12, a seventh grader at Hopwood Junior High School, said most of what they picked up on campus and at the beach were cigarette butts and plastic bottles. His classmate, Alicia Lloren, 12, said she and her classmates are proud to be part of making their campus cleaner. Hopwood Junior High School had the most number of cleanup participants at 1,113. TJ Litulumar of the U.S. Transportation Security Administration joined eight other TSA employees in picking up trash at the beach side fronting the Quarter Master Road intersection all the way to the 13 Fishermen Monument and back. “We're supposed to clean up only from 9am to 11am but it's now around 12,” said Litulumar, adding that this is part of TSA's community outreach programs. 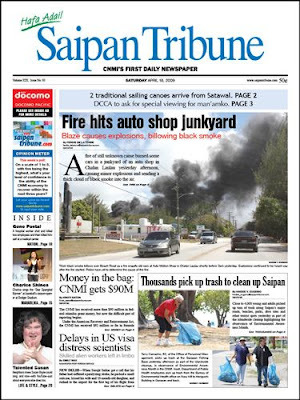 Mariana Coats and Jeremy T. Sasamoto of the Department of Public Health said they didn't mind the heat and dust to be able to help clean up Saipan. DPH employees picked up trash from Navy Hill to Horiguchi Building and back, starting at 2:30pm. “Many of what we picked up were beer cans and plastic bottles. I hope people will stop littering,” said Sasamoto. Aya Matsumoto, vice president of Pacific Eagle Enterprises, said they started cleaning up the area around the 13 Fishermen's Monument on Beach Road at 9:30am. “We also planted a flame tree. We'd like to show tourists that Saipan is clean and beautiful. We'd like tourists to come back to the island again,” she said. The cleanup will continue today. Joleen Torres, from the Committee to Elect Juan “Pan” Guerrero and Joe Camacho, said they expect 45 volunteers to clean up Beach Road this morning. Joe Kaipat of the Division of Environmental Quality and co-chair of the islandwide cleanup, said 55 volunteer groups including public and private schools, government agencies and private businesses took part in the cleanup of 48 sites around Saipan. The islandwide cleanup is cosponsored by Beautify CNMI, the Division of Environmental Quality, Rotary Club of Saipan, Marianas Visitors Authority and the Marianas Tourism Education Council. 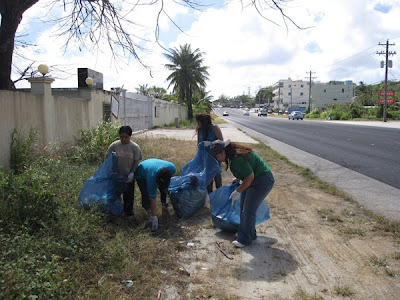 Students and staff from Northern Marianas College cleaned up the road near their campus. Great work, guys! 22 volunteers from the Department of Public Lands cleaned Isa Drive between the Northern Marianas College and the Round House in San Vicente. 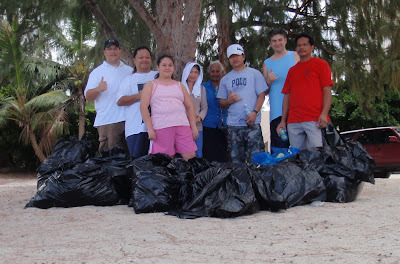 The volunteers from Pacific Eagle and Isa CNMI cleaned up the area north of 13 Fishermen Memorial. They also planted a Flame Tree. There are more photos and stories on the Isa CNMI blog. Check it out! The Docomo volunteers cleared the streets in front of their office in Gualo Rai. The entire student body of Garapan Elementary School participated in today's Island Wide Cleanup. The students cleaned up their campus. 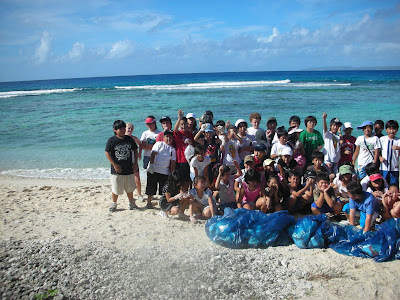 60 students and 20 parents from Saipan International School cleaned up Obyan Beach from 8:30 - 9:30 this morning. Thanks for all your hard work today, SIS! Friends of the Mariana Islands was out this morning, too! These guys are one of our most consistent, hardest working volunteer groups. You guys are the best! Thank you! FMI has more pictures on their blog. Over 4000 people are expected to hit the streets of Saipan today to Beautify the CNMI. The first person to send in their pictures was Ken Kramer. This is his son Alexander Kramer standing next to the litter he picked up in Gualo Rai. The Laolao Bay Golf Resort team were the second group to get their photos in. Here they are standing next to their impressive pile of trash. Thanks to everyone who participated today! Thanks to Beautify CNMI! partner and 2009 Island-Wide Cleanup Sponsor NTT Dococo for this wonderful map which shows the sites adopted by various private businesses, schools, government agencies, families, et al. to clean today and, we hope, in the future. If anyone wants to take a look at this map, stop by DEQ and ask for Joe Kaipat. Just a few more hours before the troops hit the ground. I submitted the following press release, hopefully in time for Friday's papers. Our tally going into tomorrow is 4018 volunteers. 4000 volunteers are set to hit the streets and beaches of Saipan tomorrow in what is expected to be the largest island-wide cleanup in Micronesian history. Division of Environmental Quality, Rotary Club of Saipan, Marianas Visitors Authority (MVA), and Marianas Tourism Education Council are the co-organizers of the island-wide cleanup. Supplies were donated by MVA and McDonald’s. For more information on the how to participate in the cleanup, contact Joe Kaipat at 664-8500 or Angelo Villagomez via Email at angelovillagomez@gmail.com. A list of all participants can be found by visiting http://beautifycnmi.blogspot.com. Several community groups, businesses, and government agencies have already submitted their pledge to adopt spots for our islandwide destination enhancement day on April 17, 2009. You can adopt your own spot or participate in one of the existing cleanups. This will be an underwater cleanup. Mike will provide mesh bags. Office of Personnel Management and Lollipops are going to recruit some of the surrounding businesses to participate in the cleanup. 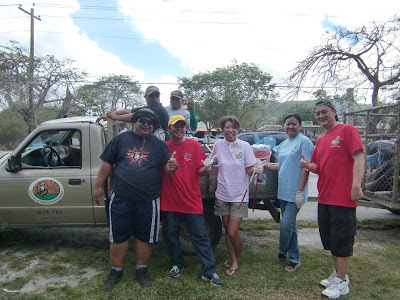 The PDM Promoters Inc have teamed up with other groups on Saipan to clean the Garapan Tourist District every month since October 2006. They are going to recruit some of the local businesses in Garapan to participate. Betty Koichi and her volunteer friends are looking to hook up with another volunteer group to do a cleanup. The Pacific Eagle volunteers are going to do a trash cleanup and plant a flame tree to commemorate the day. The 3rd - 6th grade students will cleanup the beach. The group will start at the intersection where Beach Roads meets American Memorial Park, head south to Garapan Street, then east towards Chalan Pale Arnold (Middle Road), north towards CHC, and finally west back towards their starting point. The group will clean Middle Road from Navy Hill traffic light intersection north to the traffic light at Bank of Hawaii and then back. They will paint over graffiti in Lower Mihaville. Grades 2, 3, and 5 are going to participate in the cleanup, along with some parents and teachers. 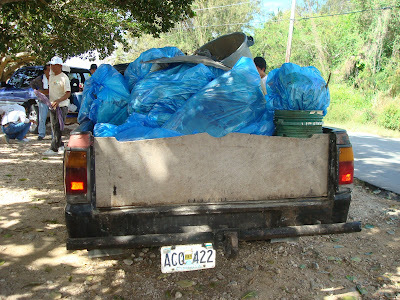 MORE than a thousand individuals have volunteered to join the second islandwide cleanup slated for April 17, 2009, and their number is still increasing. Regency that 22 groups had already confirmed participation and 19 sites had been adopted for cleanups. The volunteers are from businesses, government agencies, schools and organizations. “We are inviting everyone to join us in this year’s islandwide cleanup. You can adopt a spot, either your favorite beach, a tourist attraction, or the road in front of your home, business, or office, or you can join another group at their cleanup,” Villagomez said. He is optimistic the organizers can reach their goal of recruiting 5,000 volunteers for the cleanup. As of yesterday, 1,201 volunteers had signed up. Adopted sites include Beach Road from Afetnas to Koblerville, Garapan Fishing Base Complex, Coral Tree Avenue and Paseo de Marianas, Susupe area around Shirley’s including the Mt. Carmel Church and School area, 13 Fishermen Memorial, Laulau Beach dive spot, Micro Beach, Isa Drive to Botanical Garden, Laly 4 Beach, Chalan Kanoa, Garapan main streets, Kagman III, Phase IV, Manga Street, Beach Road from Rainbow Photo to Hard Rock, Garapan McDonald’s to Carolinian Utt, Middle Road, Garapan, Obyan Beach, Navy Hill Lighthouse, and Grand Hotel to Sugar Dock. The co-organizers of the cleanup are the Division of Environmental Quality, the Rotary Club of Saipan, the Marianas Visitors Authority, and the Marianas Tourism Education Council. Villagomez said MTEC is setting aside $900 for the Public School System to be divided among the top schools with the highest percentage of student turnout for the cleanup. For more information, contact Joe Kaipat at 664-8500, Angelo Villagomez at 285-6462 or e-mail him at angelovillagomez@gmail.com . 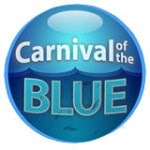 Carnival of the Blue 23 is now posted at Deep Sea News. I contribute regularly to this blog carnival, having hosted twice. Carnival of the Blue is published on the first Monday of each month. Topics relate to the ocean and conservation, hence the 'blue.' Next month it is hosted on Sea Notes, the blog of the Monterey Bay Aquarium. The Committee Chairs of Beautify CNMI are seeking nominations for their annual Beautify CNMI Steward and Beautify CNMI Champion awards. The two awards will be given out at the end of April. The awards are given out to recognize the individuals or groups who have been environmental leaders during the past 12 months. There are two award categories, the Environmental Steward and the Environmental Champion. The Environmental Steward award recognizes a person or group that leads the community in activities that help protect our environment in a variety of ways. This individual or group has demonstrated the need to take pride in our islands and to take care of the place we all call home. They serve as an example for others, especially the next generation, to follow. The Environmental Champion award recognizes a person or group that exemplifies the Beautify CNMI spirit. Those qualities include volunteerism, cooperation, innovation, creativity and the ability to infect others with the Beauty Virus. The Environmental Champion is a role model for others to follow. They bring environmental issues to the forefront of public consciousness. They make things happen and effect change. “The Champion Award winners are the environmental leaders on Saipan,” explained Beautify CNMI founder Cinta M. Kaipat. The 2007 Environmental Champion winners were PSS teacher Bree Reynolds, MINA board member Kathy Yuknavage, and local activist Captain Carl Brachear. The winners of the 2007 Environmental Steward award were elementary school student Adam Sablan and volunteer group Friends of the Mariana Islands. The 2008 Environmental Champion winners were Nava Khorram, Marites Castillo of Friends of the Mariana Islands, Katie Busenkell of PAWS, Mike Tripp of Marianas Dive, and Aqua Resort Club. The winners of the 2008 Environmental Steward award were Friends of the Marianas Islands, Marianas Dive, Paseo de Marianas Promoters and Max Aguon and the Pantalon Boys. To nominate an individual or group, submit a written nomination explaining why that person or group deserves recognition. You can make as many nominations as you like, but individuals and groups can only be nominated for one award category. Nominations must include the award category the nominee is being considered for, a well written argument detailing the reasons why this nominee should be considered, and contact information for the nominee and for the person making the nomination. Send nominations to Angelo Villagomez at angelovillagomez@gmail.com or mail them to PMB 360 BOX 10001; Saipan, MP 96950 or call 285-6462 for more information. The island wide cleanup that is being planned for next Friday was independently planned by three separate organizations. I wrote about organizing an island wide cleanup on The Saipan Blog back in January. In February I got an email from DEQ saying that they were planning an island wide cleanup as part of the Commonwealth Earth Day celebration. Then last month, Marianas Tourism Education Council (MTEC) contacted me to let me know that they were also planning an island wide cleanup in April. We immediately decided to work together (this is back in February) and started roping in other partners. Marianas Visitors Authority agreed to donate $1500 for supplies and last week, Tan Holding, the largest employer on the island besides the government, pledged to have all their companies participate (three hotels, several restaurants, an insurance company, a newspaper, among others). A big part of MTEC's involvement is giving support and financial assistance to the local schools. They donated $1000 towards the cleanup effort. They originally offered to split the $1000 equally between the schools and Beautify CNMI, but I asked them to change it to $900 for the students and only $100 for us. The way I figure it, I'm really good at scrounging up supplies and volunteers and if there is money available for students, better to support the students. They issued a press release about their donation today. 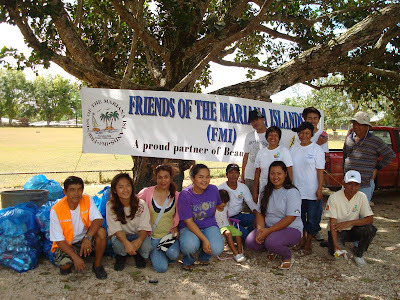 Saipan, Commonwealth of the Northern Mariana Islands (CNMI) – Personal responsibility in having a clean tourism destination is being highlighted by Marianas Tourism Education Council (MTEC), as the group announces cash incentives for Northern Marianas schools that join the Earth Month Island-wide Cleanup on April l7, 2009. In addition to $100 donated to event organizer Beautify CNMI!, MTEC is setting aside $900 for the Public School System to be divided among the top schools with the highest percentage of student turnout for the cleanup. Beautify CNMI partners Division of Environmental Quality, Rotary Club, and Marianas Visitors Authority are inviting all residents to plant a tree, paint over some graffiti or cleanup a road or a beach during the event. Cleanup over the weekend is also encouraged for people not available on April 17. Assistance with gloves, trash bags, and trash transfer are also available from Beautify CNMI! Sign-up forms will be the basis of awarding the MTEC incentive. Forms are available from Rotary Club member and event co-organizer Angelo Villagomez at angelovillagomez@gmail.com. 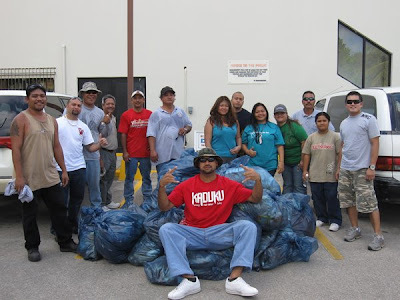 A complete list of participants for the cleanup can be found at http://beautifycnmi.blogspot.com. As of today (April 7), six spots have been adopted by eight organizations, accounting for 136 volunteers. The coordination of the cleanup is going very well. As of 8:31 AM on Wednesday, April 8, we have 11 sites adopted by 13 different groups representing 591 volunteers. We are about 1/10 of the way there with 9 days to go to continue building excitement. I'm optimistic that we'll reach our goal of 5000 volunteers! Two former residents of the CNMI have donated $300 in prizes to be given out to participants of the upcoming island-wide cleanup. Ron and Nancy Kramis of Bellingham, Washington decided to donate the prize money because they wanted to somehow participate in the event planned for April 17. 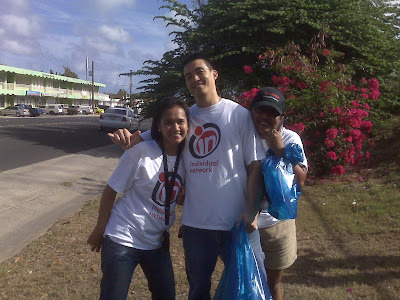 “We’ve been following Beautify CNMI since it was formed and when we lived in the CNMI we would volunteer. We are back in Washington now and we wanted to help out. Ron came up with this idea for us to participate,” commented Nancy Kramis who worked with PSS and DPH when she was living in the CNMI. “Whoever wins the prizes can spend the money anyway they like, but when I came up with the idea I thought that the prizes could be used to purchase school supplies or more cleanup supplies. Maybe if some students win they could have a pizza party to celebrate their hard work,” added Ron Kramis. Event organizers have decided to use the prize money to give out three $100 prizes. The first prize will be $100 cash given to one of the participating groups at random. Every volunteer group, business, or school that participates will have their names put into a hat and one of them will be the lucky winner of $100. The other two prizes require the coordinators of the volunteering organization to submit a photograph. The volunteer group that picks up the most garbage, as evidenced by a photograph of trash collected on the day of the cleanup will win $100. Likewise, the volunteer group that recruits the most volunteers, as evidenced by a group photograph on the day of the cleanup will also win $100. “We are blessed to have such generous benefactors. These prizes are a nice way to reward all the hard work that volunteer groups have been doing for Beautify CNMI over the years. Ron and Nancy Kramis deserve a heartfelt si yu’us ma’ase,” said event co-organizer Angelo Villagomez. Division of Environmental Quality, Rotary Club of Saipan, Marianas Visitors Authority, and Marianas Tourism Education Council are the co-organizers of the island-wide cleanup. For more information on the how to participate in the cleanup, contact Joe Kaipat at 664-8500 or Angelo Villagomez at 285-6462 or via Email at angelovillagomez@gmail.com. Two and one half years ago, the Beautify CNMI campaign put together an event called “1020 on 10/20.” We challenged 1,020 people to spend a few hours on October 20 doing something to make these islands a better place to live and visit. Over 3,380 locals, contract workers, government workers, business owners, elected officials, and students heeded the call and spent the morning of Oct. 20 picking up litter off roads and beaches, painting over graffiti, and planting trees. Our collective efforts were impressive. If my records are to be believed, that year the Coastal Resources Management Office teamed up with the Mariana Islands Nature Alliance to remove 380 lbs of trash from Tank Beach. The students at Gregorio T. Camacho Elementary removed 500 lbs of trash from the beach behind their school. 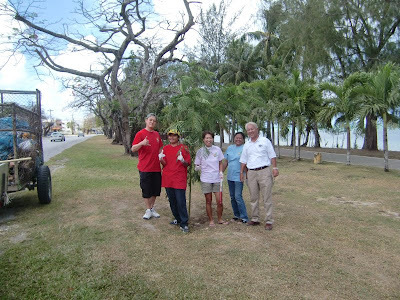 The Division of Environmental Quality cleaned up the area north of the 13 Fishermen Memorial and planted several dozen coconut trees. They removed 280 lbs of trash. All told over 9,120 lbs of litter were removed from the 32 cleanup sites adopted in 2006. A second islandwide cleanup is being planned for April 17, 2009, as part of the Commonwealth's celebration of Earth Month. The concept for this event is similar to what we did with “1020 on 10/20.” We are asking community members, business owners, and government agencies to spend up to two hours enhancing the areas around their homes, businesses, and offices. Several organizations are helping us organize this cleanup. The Rotary Club of Saipan, Marianas Tourism Education Council, and Division of Environmental Quality are the lead coordinators. The Marianas Visitors Authority is donating $1,500 for the purchase of plastic bags, rubber gloves, and paint supplies. They will be available for pickup at DEQ later this week. DEQ has also pledged to use their trucks and staff to pick up and transfer all garbage to the Lower Base transfer station, which Department of Public Works will be keeping open late to accommodate us. Additionally, Governor Fitial has agreed to allow all Executive Branch agencies to participate in this islandwide cleanup during working hours. More information on their participation should be forthcoming from the Governor's Office and the Division of Environmental Quality. I humbly invite you to join us in this year's islandwide cleanup. You can adopt a spot, either your favorite beach, a tourist attraction, or the road in front of your home, business, or office, or you can join another group at their cleanup. A list of all of this year's adopted spots can be found at http://beautifycnmi.blogspot.com. Simply contact the coordinator for that location and tell them you want to join. If you would like to adopt a spot this year, please call me at 285-6462 or Joe Kaipat at DEQ at 664-8500 or email me at angelovillagomez@gmail.com. I will send you the one-page sign up sheet and help you with your adopted spot's logistics. These islands are our home and if we don't take care of it, nobody else is going to do it for us. The Beautify CNMI campaign has always belonged to the entire community. I will often say, “Everyone is a member of Beautify CNMI, even if they don't know it yet.” This campaign has always been one of the people and by the people. When we didn't have money for garbage bags, somebody has always donated them. When we needed volunteers, somebody has always given us their time. With this cleanup, we are asking for your help one more time. This cleanup comes right around the time of the third anniversary of Beautify CNMI and I'm looking forward to this event launching us into a successful fourth year. Again, I humbly ask you to participate in this year's islandwide cleanup. Participate with your family, your co-workers, or your classmates, but please participate. I am working with the Division of Environmental Quality, Marianas Visitors Authority, Rotary Club of Saipan, and Marianas Tourism Education Council to coordinate an island wide cleanup for April 17, 2009. The concept for the cleanup is simple: If several thousand people spend just a couple of hours doing something to improve the islands on the day of the cleanup, the following morning the islands will look pretty nice. This will make our islands look pretty snazzy in time for Earth Day and for Tourism Month in May. The coordinators are asking people, businesses, government agencies, schools, and homes to spend an hour or two doing a cleanup at anytime on Friday, April 17, 2009. If you want to adopt a beach that is great, but we are encouraging people to adopt the area near their place of business. Governor Fitial has agreed to allow ALL government agencies to participate during working hours. More information on that should be forthcoming from DEQ and the Governor's Office. I hope you can participate. I've created a simple signup sheet that will help us track our activities. If you would like me to send you one, please email me at angelovillagomez at gmail dot com. After you fill it out, please either fax or email it back in. The first 50 people have signed up for the Island Wide Cleanup slated to take place on April 17, 2009. The Saipan Mayor’s Office and the Office of Personnel Management were the first organizations to turn in their sign up sheets. The Office of Personnel Management has adopted the Garapan Fishing Base and has pledged to recruit 20 volunteers to help beautify the area. Likewise, the Saipan Mayor’s Office has adopted Beach Road from Afetnas to Koblerville and has pledged 30 staff for roadside trash collection. “Our first two signups adopted the roads and areas near their offices. This is what we envisioned when we started planning this cleanup,” said co-organizer Joe Kaipat of Division of Environmental Quality. “We hope to get at least 5000 volunteers this year,” he added. According to the organizers, the goal of this year’s island wide cleanup is to recruit at least 5000 volunteers to spend a few hours beautifying the islands, whether it is by picking up litter on a road or beach, painting over graffiti, planting a few trees, or participating in some other activity. The cleanup organizers are encouraging participants to adopt a spot near their homes, offices, or schools, although some organizations will adopt beaches and/or tourist sites. The organizers are encouraging the community to get involved as much as possible. The Marianas Visitors Authority is providing funds for garbage bags, rubber gloves, and some paint and the Division of Environmental Quality has pledged to assist with transferring solid waste collected to the transfer station in Lower Base. Supplies, if needed, will be available for pickup at the Division of Environmental Quality. Division of Environmental Quality, Rotary Club of Saipan, Marianas Visitors Authority, and Marianas Tourism Education Council are the co-organizers of the island wide cleanup.